1999 Perth Mint Centenary Gold Proof Bi-metallic Sovereign (Reverse). Image: M J Hughes Coins. 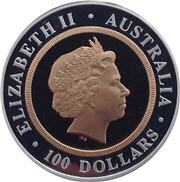 1999 Perth Mint Centenary Gold Proof Bi-metallic Sovereign (Obverse). Image: M J Hughes Coins. The 1999 Perth Mint Centenary Gold Proof Bi-metallic Sovereign was issued by the Perth Mint to commemorate its 100th anniversary of opening, 1899 – 1999. It has a face value of $100 Australian Dollars. The bi-metallic Sovereign has a solid 22 carat gold centrepiece as would be found in a standard gold sovereign, and is surrounded by a 0.999 fine silver border. Ian Rank-Broadley’s (fourth ) portrait of Queen Elizabeth II is on the obverse. The silver border shows ‘ELIZABETH II AUSTRALIA $100’. On the reverse, the 22 carat gold centrepiece depicts Benedetto Pistrucci’s famous image of St. George slaying the dragon, with the mintmark ‘P100’ positioned just below (where the date would be on a standard sovereign). 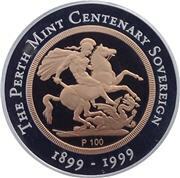 On the silver border is the words ‘THE PERTH MINT CENTENARY SOVEREIGN 1899 – 1999’. The coin has a total weight of 13 grams, with the 22 carat gold centrepiece weighing 7.98 grams, and the silver border 5.02 grams. It is 32mm in diameter. Only 7,500 sovereigns were designated by the Perth Mint in 1999 although the declared mintage was actually 5,625. 1999 Perth Mint Centenary Gold Proof Bi-metallic Sovereign Case. Image: M J Hughes Coins. The coin was originally housed in a Perth Mint acrylic capsule, presented in a circular wooden case with outer maroon card box, accompanied with an individually numbered certificate of authenticity (COA). 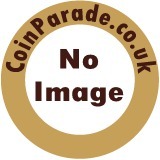 My thanks to Max Hughes (M J Hughes Coins) for the photographs of the coin he has for sale. 1999 Gold Proof Sovereign, Perth Mint Centenary, Original Box & COA.